With this kit, urinalysis can be performed by adding reagents to a urine sample. Students analyze simulated urine samples to understand the procedures used in urinalysis and the potential applicability of urinalysis as a diagnostic tool. After adding different reagents to urine samples, students observe how each reacts with substances in the urine, providing useful evidence for identifying different substances. Students test simulated urine samples for pH, density, glucose, phosphates, and chlorides. 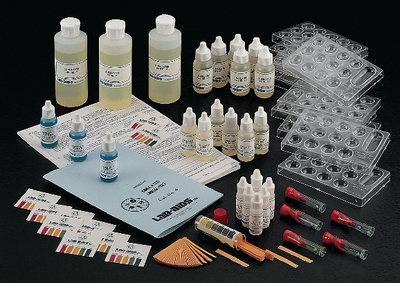 Ordering information: This kit includes a teacher’s guide with SDS, student worksheets and guides, Chemplates with spatula, density tubes, pH color charts, universal Indicator paper and vial, Benedict’s Solution with drop control bottles, chlorine test solution 1 with drop control bottle, phosphate test solution 1 with drop control bottle, Phosphate Test Solution 2 with drop control bottle, Simulated Urine I with drop control bottle, Simulated Urine II with drop control bottle, Simulated Urine III with drop control bottle, Simulated Urine IV with drop control bottle, and Simulated Urine V with Drop control bottle Materials. A hot plate, Bunsen burner, and test tubes are required but not included.